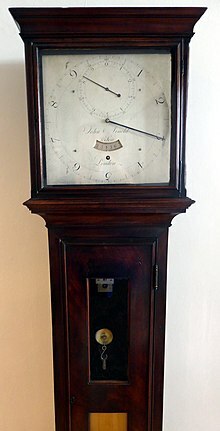 One of the two known surviving sidereal angle clocks in the world. It was made for Sir George Augustus William Shuckburgh. It is on display in the Royal Observatory, Greenwich, London. This astronomical clock uses dials showing both sidereal and solar time. ഖഗോള വസ്തുക്കൾ കണ്ടെത്താൻ ജ്യോതിശാസ്ത്രജ്ഞർ ഉപയോഗിക്കുന്ന ഒരു സമയക്രമീകരണ സംവിധാനമാണ് സൈഡീരിയൽ ടൈം. ഈ സമയം ഉപയോഗിച്ച്, രാത്രി ആകാശത്തിൽ ശരിയായ രീതിയിൽ ദൂരദർശിനിക്ക് എളുപ്പത്തിൽ പോയിന്റ് ചെയ്യാൻ സാധിക്കുന്നു. ചുരുക്കത്തിൽ, സൈഡീരിയൽ ടൈം എന്നത് "നിശ്ചിത നക്ഷത്രങ്ങളെ അപേക്ഷിച്ച് ഭൂമിയുടെ ഭ്രമണത്തെ അടിസ്ഥാനമാക്കിയുള്ള സമയ വ്യാപ്തിയാണ്. Photo of the face of one of the two Sidereal Angle clocks in the Royal Observatory in Greenwich, England. ↑ NIST n.d. A more precise definition is given later in the lead. Astronomical Almanac for the Year 2017. Washington and Taunton: US Government Printing Office and The UK Hydrographic Office. 2016. ISBN 978-0-7077-41666. Bakich, Michael E. (2000). The Cambridge Planetary Handbook. Cambridge University Press. ISBN 0-521-63280-3. "Earth Rotation Angle". International Earth Rotation and Reference System Service. 2013. ശേഖരിച്ചത്: 20 March 2018. Explanatory Supplement to the Ephemeris. London: Her Majesty's Stationery Office. 1961. "Time and Frequency from A to Z, S to So". National Institute of Standards and Technology. Urban, Sean E.; Seidelmann, P. Kenneth, eds. (2013). Explanatory Supplement to the Astronomical Almanac (3rd ed.). Mill Valley, CA: University Science Books. ISBN 1-891389-85-8. ഈ താൾ അവസാനം തിരുത്തപ്പെട്ടത്: 05:52, 5 ഏപ്രിൽ 2019.